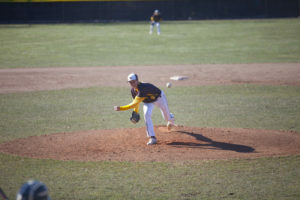 The Rowan baseball team has continued their hot streak after a blowout 13-1 win over visiting Neumann University on Monday, a 2-0 victory against Haverford University in Pennsylvania on Tuesday and a 3-2 win at Neumann on Wednesday afternoon to secure the season sweep. The brown and gold now stand at 14-1 for the year. Since March 9, Rowan has gone a perfect 11-0, averaging 9.8 runs per-game during the winning streak including their 8-0 sweep at the RussMatt Central Florida Invitational. Drew Ryback pitched a gem against Neumann, allowing only one run in six innings and winning his fifth game of the year to put him at 5-0. As they have lately, the team’s offense exploded over 8-8 overall Neumann’s pitching. In the game, Rowan had runs in four different innings. After the second inning, the Knights had six hits, yet went scoreless and left 10 runners on base. 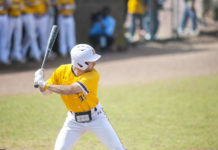 The Profs collected 15 hits, while clean-up hitter Anthony Harrold had another solid outing, going 3-for-4 while chiming in with a two-run homerun, a double and seven total bases. In week five, Harrold was named NJAC Baseball Player of the Week, as he went 14/21, had 11 runs, seven runs batted in, a homerun, four triples and four doubles. Rowan went 5-0 that week. “[Coming into the invitational] we had a gameplan, just go in there, find our fastballs and hit it hard somewhere,” Harrold said. “I think we did a great job just getting on teams and staying on top, not letting off the gas pedal…. [As for Monday’s win] I was just looking for my pitch, they gave it to me. Other than that, we did a great job at just coming out, coming out strong and getting some runs,” he added. Andrew Cartier got his second win against Haverford in the 2-0 win, allowing just three hits in seven innings and striking out nine. The Profs got both runs in the sixth inning from sophomore Alex Kokos’ double to left that drove senior Shawn Leydon home, then senior captain Monny Strickland singled to center to bring Kokos across the plate. In the second game against Neumann on Wednesday, Kokos lead the team with two hits while junior left-hander Dante Scafidi gave up two runs on five hits in six innings of work on 99 pitches. Neumann struck first with two runs in the first inning, but Rowan did the same in the second inning to tie the game at two runs apiece. The Profs would score the deciding run in the fifth with a Dan Shane RBI single down the left field line to drive freshman Justin Provost home from second. Rowan is currently first in the New Jersey Athletic Conference (NJAC), 2.5 games ahead of 10-2 TCNJ. Rowan has yet to play a conference opponent and won’t do so until this upcoming Saturday at Ramapo. 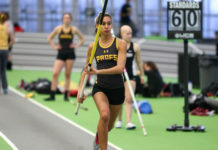 The Profs’ first conference home game will be April 6 versus Stockton. Dickson is confident in his squad when it comes to the NJAC despite having yet to play any conference opponents.